Portable washing machines are a must if you don’t like to use communal laundry rooms, if you travel a lot or if you have an RV that you like to take trips with. Having fresh and clean clothes all the time is essential to feel comfortable throughout your travels, but that is not possible if you don’t own one of these products. Mini washers that are portable, easy to use and install are essential if you have little space available in your apartment, dorm or RV and they contribute to your general well-being. These tiny appliances offer a lot of advantages. Besides being small, they can be easily transported in your car, they help you wash your clothes whenever it is needed and they are so easy to use. More than that, most modern models come with integrated spin dryers that turn washing into a nice, pleasant experience. If you are interested in saving as much space as possible and you also think about the efficiency and energy consumption of your appliances, owning a portable washing machine might be exactly what you need. When looking to buy such a product, there are plenty of options to choose from. Ever since appliance manufacturers have understood the importance of effective space usage and optimization, they have focused on bringing consumers the best options possible. If you have done a little bit of research, you surely observed that there are compact washers available on the market, as well as larger and more advanced mini washers. However, they are all convenient, as they have approximately 8 pounds capacity and at least two programs: washing and spinning. They come with built in timers and some of them might even have built-in pumps. If you have already decided to buy the best portable washing machine for your needs, but you are not sure which one offers the most value for money, take a look at the 5 products below. We have reviewed the best-selling mini washers on the market and highlighted their pros and cons for your ease. If you are constantly on the go and you want to keep your clothes fresh and clean all the time, using a washing machine that you know is your own, you should consider this model from Best Choice Products. This affordable model is ideal for those of you who wish for a compact design and basic functions. Although this model is quite basic, it has a drier function that proves to be practical and helps you save time. One of the advantages of this product is that it can fit, wash and spin 13 pounds of laundry. You can wash 8 pounds of clothing and spin 5 pounds of the same. This washing machine has a control timer that runs for up to 15 minutes. Also, a spin cycle timer that runs for 5 minutes each load is of great help. Being lightweight and easy to transport, this product is ideal for businessmen who don’t like living in hotels and wash their clothes in the hotel’s laundry. Also, it is ideal for families that travel a lot and need to do the laundry regularly, without having to carry a lot of luggage with them just to have clean clothes to wear. The great thing about this mini washing machine is that it is powerful enough to help you do the laundry properly, yet it is very silent. It has a 1300 RPM motor and a maximum frequency of 60Hz. It measures 23 x 13.5 x 26 inches, so it is ideal for traveling. Should you look for portable washing machines that are made of high-quality materials, that are sturdy and have advanced functions, this product is probably the best option for you. 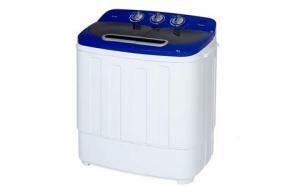 This portable washer is pricier than other similar products, yet it focuses on quality, speed and efficiency. It has a 1-cubic foot stainless steel tub and can load up to 6 pounds of laundry. It has three water levels and 3 wash cycles that you can choose from. Its LED indicators are very useful and make you feel like you are using your regular washing machine. The great thing about this product is that it has a quiet operation. If you want to install the product yourself, you will be surprised to see how easy it can be done. This portable washer comes with clear instructions and an installation kit. A quick-connect sink adapter is included and its legs can be adjusted depending on the surface that you place it on. Whenever thumping sounds are heard, you can check the legs which may be unbalanced and adjust them properly. The electronic controls make it easy and comfortable to use, so you will not struggle just because it is a miniature washing machine. It has a top load, 200 beats per minute and a capacity of 28 liters. It measures 36 x 23.2 x 23.2 inches and weighs 43 pounds so it is highly portable. Giantex brings to the market a portable washing machine that is perfect for families or for those who travel and need small appliances temporarily. Although this product is mostly made of plastic and might seem cheap, it looks quite great in small spaces. It helps you save some space and does its job as it should. 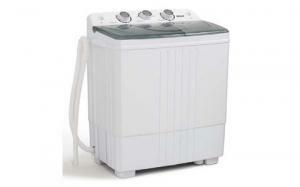 It has an 11 pound washing capacity and a 300W power. The maximum water temperature that it can use is 54 degrees Celsius, so it is not suitable for very dirty clothes. You can use this washer to freshen up your laundry on a daily basis. The spinner dryer capacity of 6.6 pounds is half of its washing capacity, yet it helps you dry clothes and lingerie that you need urgently. It has 1300 RPM, a 15 min washing cycle and a 5 min spin cycle. Its twin tub washing design includes a spin tube for the rinse cycle that you can set as desired. After washing, you can set the spin twice, for better results. Thanks to the transparent lid, you can see everything that is going on inside. It is easy to operate and to store, measuring 24.8 x 14 x 28.4 inches. Also, it can be easily transported thanks to its 32 pound weight. This small portable washing machine comes in a compact shape and design, with a nice lid that is similar to those of regular washing machines. If you care about such a product’s aesthetics, then you will like the looks of it. The great thing about this product is that it can be used to wash delicate clothing, although it doesn’t have as many functions as a full-sized one. It can wash, spin and dry, so it ca help you do your laundry quickly and efficiently. 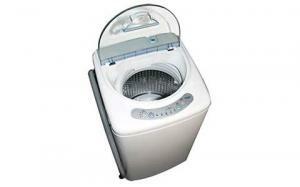 The washer has a 260W power, while the drier 140W and a voltage of 115V, the equivalent of 60Hz. This portable washing machine from Della has a spin timer that can be set to up to 5 minutes, while the wash timer can be set to up to 15 minutes. This product comes with an inlet hose and a drainage tube. It is easy to install and you can do it yourself if you only read the instructions carefully. It is made of plastic and not as silent as other similar models, but it does its job. its compact design is suitable for small spaces or for studios in which you would like to save as much space as possible. This product has a wash capacity of 11 pounds and spin capacity of 3.3 pounds, which is quite amazing for a washing machine this small. Overall, it measures 23.5 x 15 x 27 inches. It is lightweight so it can be transported easily and you will not struggle when traveling. 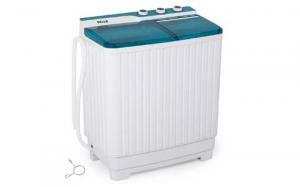 Della offers travelers yet another compact washing machine that is portable and that does a great job. Comparing to the previous product, this one has a built-in pump, which proves to be extremely useful. The drain pump drains water from the washer automatically, so you don’t have to put in any extra effort. This mini washing machine has washing and spinning cycles that can be easily controlled. It has built-in timers for these programs, a washing capacity of 8.8 pounds and a spinning capacity of 4.4 pounds, which is great for a mini washer. Unlike most mini washers that are entirely made of plastic, this model has a spin tub that is made of stainless steel and is way more durable. The product has an IPX4 waterproof rating, a power of 240 Watts and a voltage of 115. It comes in white and has a transparent lid that gives you full visibility. It is very easy to install and use and it requires minimum maintenance. Is a portable washing machine suitable for trips? 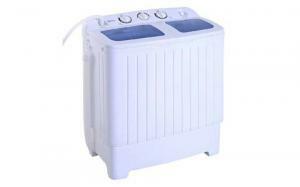 Portable washing machines are way smaller than regular ones, more lightweight and easier to use. The reason why some many people buy them is that they can be used with a smaller quantity of laundry. How many times did you wait for your clothes to gather up until being able to use the washing machine? It happens to everyone and it is surely not recommended to use it with only a few clothes. The entire mechanism can break if the weight is too low. However, those who love to travel with a van have a completely different reason for buying such a product. When traveling long distances, it is much more comfortable to have a portable washing machine in your van that you can connect to any power source than to take a lot of clothes with you. When owning one, you get to wash your clothes whenever you want. All you need is access to electricity and a water supply. The amount of detergent that you will use will be extremely low and your luggage will contain only the clothes and personal belongings that you really need. From a traveling perspective, it is an affordable and highly practical solution. Going camping for a longer period of time and especially boating becomes much more comfortable and enjoyable when owning such a product. Can you save money when using a portable washing machine? The money issue is always brought up by those who live on their own and use a regular-sized washing machine. First of all, it consumes a lot more electricity and water than a single person needs. Second, the bills that you may pay will leave you with a gap in your budget if you are not careful. Using a portable washing machine is a good way of saving money. Its capacity is smaller and therefore, you can wash a fewer clothes. This reflects in the quantity of detergent and water that you use, as well as in the power bill. This type of product is ideal for those of you living alone, in a dorm, for travelers or those who are passionate about sailing. When is it ideal to own a portable washing machine? A portable washing machine is great for a single person’s needs, but there is more to it than that. By comparison with regular ones, some portable ones have a system that implies makes water pulsate through the clothes, instead of rotating them. This means that the fabric will be less affected by the intense motion and will be protected especially if they are sensitive. If you live in a small space, yet you need to wash your clothes very often, you can easily imagine how little space a product like this will occupy. Another important aspect that must be brought into discussion is the fact that the installation process is much easier. Unlike large machines, portable ones can be plugged in normal outlets and work with all kinds of water supplies. Although mini washers require more effort than regular full-sized washing machines, they are convenient and versatile and can help you do your laundry even when you are traveling. Feeling comfortable and wearing clean clothes that smell and feel good on your skin is essential if you want to have a very good time away from home. This is the main reason why most buyers choose to go for mini washers instead of using public laundry rooms. More than that, it is a good option if you live in a studio, a dorm or if you travel in an RV regularly, together with your family or friends. Such a product helps you save a lot of space, so that you can organize your home or room as you wish. Depending on your needs and preferences, you can choose one of the products in our list. They are some of the best-sellers on the market. However, they aren’t equally powerful or advanced, so you might want to analyze their features and specifications.